Calvin Klein will launch the 2013 limited edition version of CK One Summer in April. This will be the 10th edition of CK One Summer (the first appeared in 2004, ten years after the launch of the original CK One). Notes include citrus, waterfall, watermelon, cucumber, water lily, musk and moss. 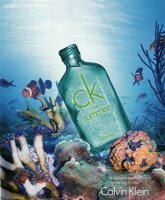 Calvin Klein CK One Summer 2013 will be available in 100 ml Eau de Toilette. CK One Summer was developed by perfumer Harry Fremont; additional notes include crushed leaves and caraway. I think they’re usually aquatic. I’ve liked some of them too. I did love the 2012 cK One Summer, and this looks like it has a similar crazed (crackled) glass surface. But the new notes – the horror! Am curious how waterfall smells. It’s hard to tell in the picture, but the glass looks like it has drops inside the glass instead of being crackled. waterfall? lol. Really? haha. At Lys, one can only know if they sniff CK One Summer!! Just call it a musky aquatic like Polo Blue and call it a day. I am waiting for CK One Be Shock Summer L’eau Fraiche Sport Noir Intense myself. I’ve now learned my lesson about drinking coffee and reading on my tablet. It was a lime green delicious citrus thing.